The online shopping website, Walmart, just purchased OneRiot to become a part of WalmartLabs. OneRiot, a Colorado-based company which originally started as a real-time search engine but eventually turned out into an advertising network, has just been bought by Walmart. As confirmed by Anand Rajaraman of WalmartLabs, the deal to acquire the social ad company was closed immediately within 30 days after they have met the team of OneRiot. The technology of OneRiot will now be part of WalmartLabs’ mobile and social shopping services. Since the retail giant is looking forward to building out a team of developers who can make an array of shopping and retail-related applications, they will be needing the help of OneRiot to mix the elements of e-commerce, social networking and mobile applications. “The OneRiot team will now be joining WalmartLabs, Walmart’s hub for the creation of new technologies and business models integrating social, mobile and retail for the next-generation of e-commerce,” OneRiot CEO, Tobias Peggs, noted in an email to VentureBeat. Several months ago, Walmart has acquired Kosmix and then invested in Yihaodian — a large Chinese e-commerce website. 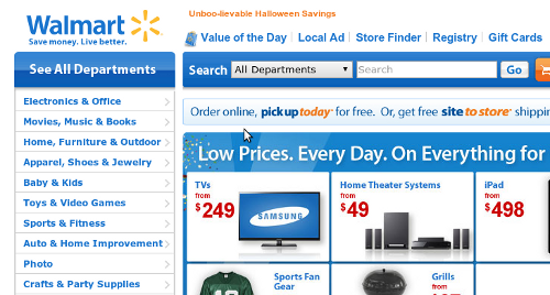 It’s still unclear what Walmart’s plans are, but perhaps they’re just aiming to expand their e-commerce services.